We are lentils lovers in my family (at large) and I have been cooking them on a regular basis (at least once a month, if not twice). Lentils come in different colors and textures. I prefer the French Blue/Indigo lentils, which take more time to cook than brown or Indian pink lentils but are firmer and therefore better keep their shape. Also, contrary to other beans, you don't have to soak them the night before!! A big plus for me! 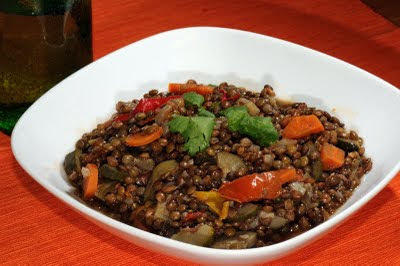 Lentils are really healthy: they are high in fiber, iron, magnesium, folate, fat-free, and high in proteins. They are also affordable, hence a great dish to serve to your family. A vegetarian version provides you with enough proteins but if your family needs "meat", you can serve them with sausages or pork chops/roast. Also, learning from my in-laws, I have started serving them with rice with olive oil on top when I don't want to cook meat but I know my husband is going to be really hungry. The kids love them too! It's delicious! Lentils make great leftovers (hot or cold)... that's why I always cook more than we need for one meal so that we can have more the following day! The following recipe is the vegetarian version and calls for different types of vegetables but I generally do with whatever is in my fridge. Bon Appétit! In a large pot , saute the onion in olive oil together with salt and cumin seeds. Stick the cloves in the half onion and add it to the lentils. Take the cloves off the onion before serving. Add fresh black pepper to taste. I generally use more water than indicated on the packaging because I like when there is some water remaining after the lentils are cooked. It makes a great sauce and I found that my children eat them better if they are in this sauce. If I have too much water remaining, I just scoop it out or I drain the lentils and let the remaining sauce reduce on the stove. If you like "hot" dish, you can add a few drops of hot sauce or fresh chili before serving. I have also started to serve them with fresh cilantro. Since I always have leftovers, I put it in my child's thermos to eat for lunch the following day or we eat them cold. Je reconnais que la présentation est "appétissant" et que cela donne envie d'aller manger chez vous!